During 2014, we are celebrating 30 years of bringing customers from the UK to the Channel Islands. As part of this celebration, we will be writing about 30 Jersey essentials, from attractions and outdoor activities to special local food and some lesser-known island treats. On a small island, natural resources feel very precious, maybe more than in larger countries and here in Jersey we definitely have a special bound with our fresh water supplies. The levels are monitored daily by walkers, dog walkers and many a jogger knows where to stop to catch their breath in front of a spectacular view point. Walking around the reservoirs is as much part of the island’s life as going to the beach. Val de la Mare reservoir is probably the most picturesque with great views over the Atlantic Ocean and a 4.5 km walk through woods and along side the water. 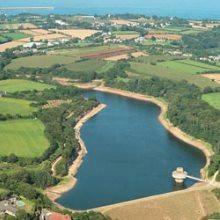 Val de la Mare doesn’t look like a reservoir at all until you reach the damn. It was built in 1962 as the population started to increase and although at the time the flooding of this beautiful area wasn’t to everyone’s taste, it now looks more like a natural lake with delicate and abundant flora and fauna for everyone to admire. An Arboretum was also created in 2012, with no less than 300 trees. The walk is only challenging if you decide to go the full way around as you will have to go down and up the height of the damn. Well-positioned benches let you sit and take in the panoramic views, allowing for pauses and rests. Located in the western Parish of St Peter, Val de la Mare is easily accessible by car or by bus. Queen’s Valley reservoir is the newest and the largest in Jersey. Built in 1991, it holds about 48 days supply in two inter-connecting sections, both of which provide excellent walking paths and beautiful scenery. The full loop is 3.1 km of easy walking with birds and flowers to take in as you stroll past. Queen’s Valley offers a peaceful environment very much appreciated at the weekend by couples, families and keen fishermen trying their luck at trout fishing. Queen’s Valley is located in the east of Jersey, close to the iconic Mont Orgueil Castle in Gorey. Before chlorination and pressure filters were in use, before desalination was considered as an option to top up the water supplies in time of drought, Jersey started collecting water in what is now known as Waterworks Valley in the south of the island. Several reservoirs of various size are still in use but do not offer specific walking circuits. They are actually fully integrated in the countryside and can be seen from many a walk. Located in the parish of St Lawrence, Waterworks Valley is one of the rare wooded parts of the island, offering a fresh and green contrast to the coastal areas. A self-guided walk – The Millenium Walk – passes through this charming valley and will take you past the Millenium cross, a standing stone and the northermost Dannemarche reservoir. This entry was posted in Jersey Activities, Places to Visit and tagged reservoirs. Bookmark the permalink.